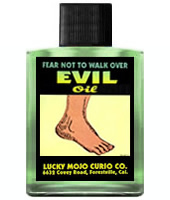 I have a Fiery Wall of Protection Mojo bag, I wear an evil eye anklet, I take cleansing baths, I mix protection oil in all of my oils that I wear just to be safe. I do all of this because someone is always doing some type of Hoodoo/Voodoo on my. Well this time someone has decided to attack my situations and I'm not sure how to get out of these binds! My body, health, and sanity are in check but I'm going broke, my love life is a mess, all of my electronics, appliances, vehicles, and broken or breaking down and I don't have the money to fix them. I was even served an eviction notice because my grass was too high! I had money to pay people to take care of my lawn but no one would ever arrive to cut it! My former pastor accused me of putting a curse on him. Rumors have spread all over town about my involvement in voodoo. Co-workers are causing me all types of trouble. I used to pleasurably date several men at a time with ease and now they all just torment or ignore me. My child brought home a used bear that had a spirit attached to it that wreaked havoc on our home for weeks! A reader helped me to identify to bear and to get rid of it. I blessed our home and it feels clear again. I has been for a few months but I'm seeing spirits at work now. But we can not identify the person who is working against me this time or the type of work that they are using! I know the church was (probably still is) praying against me. I also feel there is someone else involved. I feel like it's the mother of the girlfriend of a guy that I was seeing while they were "on a break". I just have that feelings. He left me, got back with his ex, and my life has been a mess ever since. This has been going on for five months! What should I do?? If you haven't already done so, clean your home with Chinese Wash and put up protection. In your case, I would use Fiery Wall of Protection. You should also get a protection amulet and wear it on you at all times. I would also work with Archangel Michael, who is a fierce protector of those in battle with spiritual enemies. I wish you the best of luck. Please keep us posted. Thank you, I will try this! I have been seriously been thinking about getting a protection seal or sigil tattooed! Let me first say : I have been a lurker on this forum for years! I LOVE it. I made an account today because I am finnally ready to ask for help, recieve guidance, and make purchases. For over 6 years now I have been the focus of malifecient workings. MY life has been at rock bottom that long- every thing I have worked at to right it gets ruined. My life, social life and financial life have been devistated - null and void. The first two years I refused to think I was under any attack. I am a "Harm none" type of worker, and that mode I follow religiously. However, in the 3rd year, the person who was working against me, came out and told me point blank what they were doing and that they were going to 'destroy me'. This caused me distress because not only were my fears realized but the person working ill against me is my own flesh and blood. So we are connected in many ways. It is not an easy thing to cure. I live on land with many family members and for that reason sha can stop by any time she wishes to visit family. She has worked hard in many ways, magically- and non magically to accomplish many things against me. She has even focused on turning family against me and toward her. Luckily for me most of my family is good clean spirits, and they will not be swayed in their love. However a few family members I am not so sure of. So, for 6 years now- given that I am of the "Harm none' Type, I have allowed her to focus upon me without retaliations. I have merely spent my time working on building myself back up and working protections and wards around me, my life and my childrens life, but they have done nothing to stop the inncessant flow of hatred fueled workings from her. I am a fairly clairvoyant/clairsentient person and I feel that a lot of this work is the work of a third person. I am positive that she has gotten someone to work against me on her behalf. The largest bouts happen in predictable cycles. Halloween being the main attack of the year- at this time she travels (yearly) to New Orleans to spend a week there for gatherings. This year was no exception. Last year all of my pets died within 24 hours from unknown reasons - 10 Axolotls in 4 different tanks. This year my hamster, a rather healthy and happy animal, as all my animals are, just died in 24 hours - literally shriveled up and fell over! My dog ( I swear this is no lie) just out of the blue started *pooping* bright red blood all over my kitchen floor - just out of the blue. I was out of my mind! (The dog is still fine and healthy after that amazing display of God Knows What!!) I mean really!!?? My new and successful baking buisness went belly up dead this past week when I was doing so well I could hardy keep up with it! I have had enough. I have given her full sway and have only worked to protect myself and children and home. But this has to end! I am not well versed in any kind of darkness, and really do not know where I should begin. But six years with no sign of stopping- while my life is in near ruins and she lives like a fat hog with everything she could want ( I almost feel that she has worked to take my joys/money from me magically even) it has to end. If fighting fire with fire is the only way to stop it then so be it. I need advice, and guidance. What can be done? Like I say I do my own workings- but they are current not enough to stop her. Also she has a pretty damn good glamour on everyone. She is a greedy and selfish person and mean to the bone. However 99% of everyone who knows her thinks she is a pure saint- and I being honest and striving to my best ability to be near saintly myself am viewed as a loser, horrible scum of a person who makes bad decisions ... yadayada... you get the point. I want her glamour removed and I want everyone to only understand what she is behind her mask- how cruel and hatefilled she really is. I want everyone to understand how she works to get what she wants, I want them to hear her lies with unclogged ears. I want her workings reversed fully upon her as I refuse to accept them any longer! I want whatever she has magically taken from me, returned to me. And I want her to be judged and suffer as she has caused me to suffer these hardships and ill-events. I want her to deal with what she has placed upon me and worked againts me in sincere hopes that she realizes her own actions and has the chance to correct herself. I do not want this to last a lifetime. I want her to leave me the heck alone- I want her to have no connections to me or my life in anyway! I want to be free of her. I do not know how to navigate these waters anymore! It is all I can do to stay afloat! I am worn out now, and I need serious help. I am sorry you have suffered with this, as have your animals. When one suspects ongoing rootwork by a professional practitioner (either your enemy or (as you imply) someone she hires when she travels yearly to New Orleans), one should first get a reading. It is important to touch base with another worker who can help determine if your suspicions are correct, how the work is being done, and what your best course of action should be -- including whether you are in a good position to work against the adept enemy (or hired rootworker) and / or whether you also need a professional on your side. A reading will also let you know whether escape is sufficient or if you are justified in reversing the evil work and/or cursing the enemy beyond the level of suffering you have endured. If you want to skip that step, which is fine with me, i would recommend that you start with a mirror spell or reversing spell of some sort. A double action candle or a reversing candle burned unside down on a mirror, a flat mirror packet, or a mirror box would be among your choices. Beyond that, you wish to compel her to reveal her evil nature. For this, i would recommend a skull candle. Then you ask for her to move away from you socially (and perhaps physically). This is called a Hot Foot spell. Each of these spell-families has its own thread on this forum. Read the threads, select the spell or spells you wish to perform, and then, if you still have questions about those spells, ask further questions in those threads. Bleu wrote: I know the church was (probably still is) praying against me. ... What should I do?? My target gets readings from time to time and I am currently working a love spell and control spell on him. I want to know is there something that I can do to keep my name or initials from coming up when he gets a reading? Basically is there a way for me to keep someone -- including a rootworker -- from knowing that I have a spell on him? I have a multifaceted issue that I would love to get some advise on. Anyway, When I have gotten readings done for both him and her, it always shows that he is torn between me and her, that she has lit candles for him and her mother in DR has a practitioner helping. Each time him and I would talk it would be great but then he would stop completely for a few days. Now I know why. Fast forward to August, they moved in together. I reached out to an AIRR practioner that is skilled. He tried different things such as hot footing, binding her and trying to clear him, etc. and he had me use Fiery Wall of Protection and Blessing powder to place in his path and in his office. Also he stated to use Breakup oil and powder in the same fashion. There would be an improvement for a week or so and then back to silence it went. My thoughts as well as the practioners began to get cloudy etc. so I believe this stuff was sent back. From there I went to another AIRR person that practices more towards Breakup work that is more intense so to speak. I let him know of the situation and what was done previously. We had 2 divination sessions in which both times it was indicated that the couple would not get Engaged...Well last Wednesday they did. Mind you my other reader said the same thing so it blindsided us all. The reader said he was pressured into the engagement and his family does not like her. The reader thinks the girl is trying to "sweeten" up the family bond and also get pregnant to keep him. 1. How could the Engagement not be seen through anyone's divination? 2. Do you think that all of the work is being sent back/reversed and can I truly compat a strong practioner? 3. If the Fiance is feeding him menses (or anything else), is there a way to combat that? 5. My AIRR practioner gave me a job to do and was able to do everything except bury it (ground is frozen solid). What can I do now and if I need to dispose of it, how can I? 6. While I carry protection on me, how can I recharge it or do I need something stronger on my person? 7. My house is protected. 8. How can I keep her from getting close to the family and break the engagement. Please know that I do indeed love this gentleman and have for over 2 years. I honestly don't think I have prayed for someone so much in my life. I want him to be genuinely happy whether it is with me or not however I know this woman is not for him. She has a history of cheating (with other people at work), lying, taking men for money. My apologies if I placed this in the incorrect forum and made this way to long. I'll answer each question after the question (also, n the future, please keep your posts shorter). 7. How can I keep her from getting close to the family and break the engagement-He would have to be cleansed and then try the break up again. Please consult your AIRR member on this also. Thank you Miss Aida for your reply and guidance. I will reach out to the AIRR member today. 1. Should I have the church stop the candles? 2. Can he be cleansed without him knowing? I ask because he doesn't believe nor will she let me get near him. Can I put something in his office, etc? 3. How can we see the other practioners work? This gentleman is very important to me and I hate his free will being manipulated by her. Yes, you can have a rootworker cleanse him by proxy. To see the other person's work would need a professional. And not everybody can do it. But, if the professional knows that there's work being done, it is much easier. To cleanse by proxy, you could get a red figural candle and baptize it in his name in whiskey in the name of Jesus Christ. Then you could bathe it in Uncrossing baths. Just get a bottle of Uncrossing oil and, before dawn, add a few drops to a basin of water with a white candle on either side. 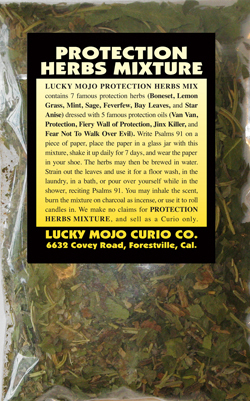 You could even do a 13-herb uncrossing bath, dunking the head and reciting Psalm 37 thirteen times. Following this, you could oil the candle with Clarity and Fiery Wall of Protection oils. Then you throw a bit of the "bath" water at the crossroads. Oh, Geez. She sounds mentally unstable. Nevertheless, it is VERY wise of you to protect yourself. VERY wise. My man is going away a few days this week (to regions where people are known to pratice magic) and I was wondering if there's any way to protect him from being jinxed or charmed/spelled during the trip? I've heard so many stories lately about females using products, charms to make men want them (to get their love, attention and money), so it's gotten me worried. 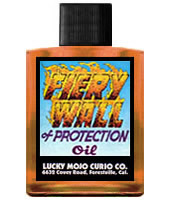 I have protection oil, fiery wall of protection and blessing oil and powders. How should I use them? Btw, people here in my country mentions thay putting garlic in the pocket will prevent one from getting jinxed. 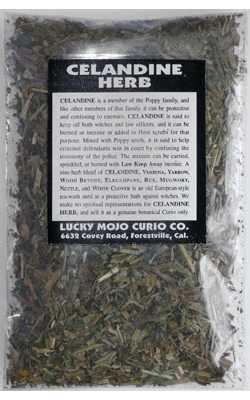 What other herbs would be helpful in this matter? Thanks and bless you! I have a friend in Florida who contacted me about some serious problems she has been having at work that appear to have a dark magickal origin. It's a new job she just took up a few month ago, but it has become a living hell for her. Her office is full of bullies who constantly harass her and try to get her to quit--her new boss being the worst of the bunch. The reason she contacted me is because many of the attacks appear to be coming from magickal usage by her co-workers. Lots of misfortune has been happening to her since the folks in her office "have been burning herbs before work" and she has been given "gifts" to take home (which she has now gotten rid of). Among the goings on have been a near-fatal blowout of a tire on her car and a small fire in her kitchen (that burned her a bit). She's been having a hard time sleeping and has been increasingly exhausted. As if "there is something trying to prevent me from getting to the office." Things have been getting worse and worse. And just this morning, what appears to be an "A" and an "X" were found scratched on her door. Thus her call to me. This lady knows zilch about magick or rootwork. But her long, detailed explanation to me indicated someone--either her co-workers or someone else--has been aiming some pretty dark energies towards her. From what I gathered on her situation, she is the target of the hatred of several women who are jealous of her job, her abilities, and her beauty. They seem to be using some sort of regional tradition but I can't be sure what. Perhaps the "A X" is a tipoff to what is at work here. Does anyone here have any suggestions, Ideas or thought on what is going on and how she can protect herself from it? Again, she has zero knowledge about this stuff. So it has to be simple but very effective. I may be able to help her a bit more if I know what sort of tradition she is dealing with (Miami area). But being a thousand miles away makes that harder to figure out. I am sorry your friend is experiencing this. With it sounding this serious use I would recommend working with a professional. Some things to think about would be Uncrossing products and Reversing products (http://www.luckymojo.com/reversing.html). There is a mirror box spell described on the Reversing page that would be helpful. In general when someone is crossed up I recommend Uncrossing, Blessing, and Protection work as a general formula. Thanks Nathan! That's very helpful. I'll pass the recommendation along to her. My situation is really more annoying than anything else, but I have an ex who is also a practitioner - albeit of a different tradition - and I can feel him trying to get back into my head. He did not want to break up and I think he's trying to plant some seeds of reconciliation but I'm way stronger magically and mentally than he is so all he's doing is making me angry and irritated. My main concern, apart from the fact that I just don't at all want to be thinking about him all the time, is that he might be doing something to interfere with my current relationship and no way in hell am I allowing that to happen. Obviously I have protection work going on my relationship, but what else would y'all recommend? Do you think Banishing would be sufficient to get him out of my head? I don't want anything bad to happen to him, I just want him to move on. You could try Reversing on him, to send any magic back to him if he is indeed sending destructive energy towards you and your relationship. Please forgive me if I am posting this in the wrong location. After much search, I couldn't find a more appropriate place. I'm doing some protection work from a practitioner who has been doing this and other magical work for about 3 years, personally not professionally. Frighteningly, this person is quite evil and has no business using this or any other type of magic. Without access to their personal concerns, I've been trying to use photos. After acquiring many enemies, this person has become very cautious in the types of photos they publicly post. They have stopped posting pictures of them alone looking directly at the camera. They are either wearing sunglasses, they have other people in the photo with them and are looking sideways at the camera, or they are wearing some type of hat or headdress. This is obviously an intentional form of self protection. I'm wondering if anyone knows about the specifics of using photos in Hoodoo, Rootwork and Conjure spells. In other words, are any of the above described photos going to be of value in doing my own jobs? It sounds like that is what your enemy practitioner is doing, one way and another. My recommendation is to get a birthdate and, if possible, the mother's name. Print out every photo, and on it write "[Name] son/daughter of [Name], born on [Date]." If you can get foot-track dirt, obtain that as well. Burn all of the papers to ash with Quassia Bark on charcoal. Powder the ashes (adding the foot-track dirt, if any) and mix them with either soft modelling wax or self-hardening craft clay, and form a doll. Use the best photo you have as a face (or even a full-length portrait) for the doll. Baptize the doll, "[Name] son/daughter of [Name], born on [Date]" -- and know that you now have created a real link to the person. Work with the doll as you would any other doll, for restraining, tying, pinning, nailing, binding, harming, casting away into a river, melting, burning, or freezing in darkness. Thank you, miss cat. This is phenomenally helpful! I don't have the foot-track dirt, but I've got everything else. I need help bad! Please!?! I was seeing an AIRR reader for two years. I started seeing them when I met my last boyfriend and every time I would call the reader my boyfriend and I would have the worst fights and then I would call again to get more help. Anyway long story short is that the reader was causing us to fight so I could continue to come back. And now me and my daughter are sick and having similar pains and my daughter is five and we haven’t had any accidents of any kind. No one has access to our home except me and her. I’m really afraid because we’ve both gone to the doctors and there is nothing wrong and we’ve done baths and we get better for a few days and then we are sick again. We’re both having nightmares and I’m even more afraid because the reader has our pictures. What can I do to protect us? How can I rid us of this negative work once and for all? Please don’t tell me to get a reading because I refuse to after trusting the reader before who is a part of the community that’s recommended here. I trusted that person and this happened. I’m not here to bad mouth anyone that’s why I’m not saying any names but please someone help us because my daughter doesn’t deserve this and neither do I.
I'm so sorry you are going through this. Sometimes when we have work done to help us out of a negative situation, the negativity appears to be compounded. If those original problems were the result of negative energy sent your way deliberately, you may be encountering resistance from that person, or they sense your efforts to clean up the mess they threw at you and are doubling down on their own. It may not be coming from the person you trust to help you, but from the person they are fighting against on your behalf. If you work with saints, petition Archangel Michael as he protects us in battle, and is a fierce defender of those who are unfairly attacked. Light a candle to him and pray the 91st Psalm. Keep working with him and he will help you. He has never, ever let me down. I truly hope this helps, and I wish you the best of luck! I've been dealing with a practitioner diagnosed with Narcissistic Personality Disorder who destroys people for sport and power in real life and the magical realm. They've been a serious practitioner for a little over 3 years but not professionally. After all the havoc this person has wreaked in many people's lives who have justifiably retaliated, this person was forced to leave town but not without harnessing every possible mode of protection to avoid accountability and additional retaliation. I knew the narcissist in question was working on me (and others) both because they announced it and because I had all the signs like 3 minor car accidents in one week and all kinds of uncharacteristic and unfortunate things happening out of the blue. In the last 4 months, I have done so much work to just get rid of this person's evil. The list is lengthy, but most recently, I did an intensive 13 day cleanse of self and home because I was previously getting a lot of resistance in my work. Before I started the cleanse, I got a reading from someone who is a professional practitioner but not in AIRR, and this person either has no understanding of Narcissistic Personality Disorder, didn't believe my account of this person's pillage through my town, or doesn't have a problem with this person's behavior. I thought the cleanse would at least give me some breathing room, and I'd go into the new year with a blank slate. After finishing the cleanse, I immediately protected myself with a Fiery Wall of Protection Spell since the pre-cleanse Fiery Wall of Protection hadn't worked. When I took the dirt and saucer to smash it at the graveyard, the saucer wouldn't break. Bad sign. I repeated the spell with better luck. I then moved into a Block Buster spell. The Block Buster started out great until the rolled wax/herbs caught fire. The whole candle went up in flames and burned quickly into a huge puddle of wax. I'm at a complete loss at this point. I just want to be clean and clear of this evil person for good. This is my second go around with the narcissist, but the calling card of all narcissists is to hold warped and unjustified grudges for life and circle back around when they are bored. Sadly, we are seeing this played out. So, I'm hoping someone understands what I'm dealing with. Magic in this evil person's hands is beyond dangerous. Thanks in advance for any insight and guidance. You have posted about this situation further upthread -- here: post394858.html#p392838 -- and you received some very sound advice on what to do, including from Miss cat. If you don't want to take that advice and do the work yourself, do contact someone from AIRR who could do the work for you. I'm not sure what else we can tell you here, since your query has already been answered. Please contact a professional and let them advise you directly. Athena is right. Sometimes a person who is a practitioner is stronger than someone who is seeking protection. Giving you more spells to do is not the best option if your work keeps going south, as you describe. You may need a magical coach to help you better prepare and carry out your work, or someone who will back you up with spells while you do supplementary work, or someone who will do the entirety of the work for you. Thank you both for your response. In no way did I intend to hijack this thread by posting again. I did utilize miss cat's methodology suggested above, but I didn't know in November that I was already crossed, rendering my work useless. It wasn't until a 3 weeks when the accidents started happening and the person in question announced their work that I realized the enormity of the situation, hence the deep cleanse these last weeks. I thought that would take care of it as it had the first time this person attacked me, but miss cat is right about this practitioner's strength. This person is more experienced and is lacking conscience, which cannot be underestimated. If either of you have any suggestions for an AIRR reader/practitioner experienced with this type of person and situation, I would be most grateful. Thanks again. I understand that your situation has evolved since you posted about it above. Thank you for clarifying that. We don't recommend individual rootworkers from AIRR but can vouch for them all as ethical and genuine workers. On the front page of the directory, you can scroll down and see the list of situations and conditions. If you click on the one about Protection From Enemies, it will then show you a list of members who perform that kind of work. Please read through the directory of AIRR members and contact the one who seems to "speak" most to you. You'll be in the hands of someone experienced, so this may be your best angle to remove this kind of negativity from your life. I truly hope this helps, and wish you the best of luck. Thank you kindly, Miss Athena. Because one of these posts concerned an unnamed AIRR member, i'd like to bring out into the open some issues that both of you have mentioned. They are important, and well worthy of discussion. This type of client abuse is similar to medical abuse by a doctor against patients, financial abuse by a banker or stock broker against clients, legal abuse by a lawyer against clients, religious abuse by a clergy member against congregants, and so forth. In all such cases, we see a person of supposed trust, with a specific form of advanced expertise, wielding considerable power over those who seek specialized services -- and in the midst of what was promised to be a personal and business transaction or even a long-term contracted relationship, the trusted person in power abuses that power and harms those who sought aid or services. The reasons that people in positions of authority and power may abuse their clients, fans, or followers vary greatly, for not everyone is motivated by the same emotional, social, or financial goals. Those who study this phenomenon have noted, however, a few basic patterns. Specific reasons for abuse of power may include desires for ego-stroking, self-aggrandizement, sexual contact, celebrity status, sadistic fulfillment, financial gain, free services of economic value, receipt of gifts and tributes, and more. The organization of AIRR does hold its members accountable to a certain standard of ethics and a specific code of conduct. You may read these at the AIRR site; they are pubic documents. If you wish to bring a case against an AIRR member who has violated those standards, please contact the AIRR Ombudsman for assistance. If an AIRR member is found by the Board of Bishops of the AISC to have violated the group's rules of ethical conduct, the AIRR member may be voted out of the group. If you believe that any local, state, or federal laws have been broken by an AIRR member, please contact the police. If you bring false charges against an AIRR member, it is the right of any or all members of AIRR to refuse further service to you. If I was in any way unclear, the practitioner working against me is in no way related to AIRR. I mentioned this in my initial post about this practitioner working for their own purposes, not for money. Initiallly, I was unsure if I was even posting in the correct thread at the time, but I can see how that may have gotten lost with more posts in the thread. In regards to the reader I mentioned, that person is also not in any way affiliated with AIRR either. They are a reader local to me. I greatly appreciate your opening this discussion about ethics because as clients and students, we do trust our most private lives with those we are fortunate to consult with. I just wanted to be clear because there seems to be confusion about to whom I was referring in my queries seeking help. I am on this forum to learn and run things by those more than experienced than I am. I am grateful the forum is exists and grateful for the generous advice and shares throughout the forum that support connecting with and learning from one another. I’m sure many of us cannot afford to go to a professional practitioner with every quiery big and small. Your explanations and reassurances about AIRR are greatly appreciated. Yes, i understand that the practitioner against whom you are struggling is not a member of AIRR, but Lovelygirl00, who first posted about a week ago, is dealing with a member of AIRR. I just wanted to bring the topic forward, to let Lovelygirl00 know that AIRR is self-governing and that help is available. I think that within the rootwork community the way client-abuse situations develop may initially resemble abuse in religious, sports training, military, corporate, or other hierarchical systems -- but within AIRR it does not proceed that way because unlike those systems, in which authoritarian or autocratic hierarchy is built into the system, AIRR is a collective or cooperative with an elected board of directors who may vote to expel misbehaving members in the interests if sustaining the group. For those like you who are in conflict with a rootworker or reader who is not accountable to a group such as AIRR, walking away, followed by strong protection spells, may be your easiest option.